Earth Day is an annual holiday that everyone can agree is worth celebrating. This day is an opportunity for the world to unite in protecting the beautiful planet we all call home. This Earth Day, join Get Fit Clovis and Fulton Yoga Collective for an uplifting event designed to empower you and your family to protect and preserve the treasures of our beautiful planet. Here, Get Fit Clovis sits down with actress, activist, and Fulton Yoga Collective studio director, Anna Moore, to talk about her passion for movies, healthy eating, and “date night,” as well as her newmonthly event in Downtown Fresno, the Conscious Cinema Club. GET FIT CLOVIS: Anna, what is the Conscious Cinema Club and why is it important to you? ANNA MOORE: I have held the vision of conscious movie screenings at Fulton Yoga Collective since we opened, and I am excited to see it unfolding so organically. Each month’s free community gathering will start with a 60 minute yoga class led by yoga instructor Kellee Dohrman, vegan eats available for purchase from Naomi Hendrix’ Raw Fresno Food Truck, and a screening of an awareness-building movie. It’s the healthiest way to enjoy “dinner and a movie,” which has always been one of my favorite activities. GFC: What does “conscious” mean to you? AM: In 2017, conscious means aware, awakened, enlightened. Enlightenment is an action, something that we can do at all times. If we engage in our spirit, we are enlightened to life. GFC: How does “conscious” translate into the movies you will screen at Fulton Yoga Collective? AM: These films give us an opportunity to connect with each other through sparking open dialogue about new ideas. They intrinsically raise our awareness. GFC: Conscious Cinema Club kicks off its monthly gatherings on Earth Day. What film are you screening for this first meetup and why? AM: We are really excited to be screening a documentary called Vanishing of the Bees, narrated by actress Ellen Page. This film investigates the recent decline in honey bees around the world and what implications that has for our planet. Our intention is to bring awareness to endangered animals and how we can help them. Current estimates state that we are losing between 200 and 2,000 species every year, when the natural extinction rate should be only one to five species per year. Planet Earth is currently experiencing its 6th extinction crisis, the largest crisis since the Dinosaurs once existed. The key factor in Vanishing of the Bees and future movies we plan to screen at Conscious Cinema Club is that they are very solution-oriented. These movies give us actionable steps to improve our planet for ourselves and our animal friends. GFC: Can movies really make a difference in the world? AM: Of course! A single movie can completely transform the trajectory of public policy. There is a moving story about the 1959 documentary Serengeti Shall Not Die directed by Bernhard Grzimek. The film showcases the plight of wildlife migrating through unprotected lands in Africa, and it ultimately lead to the African government enacting a complete ban on poaching endangered animals. GFC: How did you start practicing yoga and what motivated you to stick with it? AM: Practicing yoga is a game changer for anyone at any age, both mentally and physically. I started practicing yoga in Drama school at New York University when I was 17 years old, and it completely transformed my ability to connect to my emotions. As an actress, being emotionally connected is part of my job description, and my daily yoga practice keeps me tuned in and ready to work. GFC: How can yoga benefit our daily lives? Yoga is the practice of staying calm in challenging situations that are unfamiliar or stressful. Try to imagine how increasing your awarweness and physical strength would benefit you. Whether you’re working, retired, or just enjoying life, we all feel better when we improve our healthy habits and detoxify our bodies. GFC: What can Central Valley residents expect from attending the Conscious Cinema Club? AM: Conscious Cinema Club is going to be a great date night! GFC: (…both laughing…) What does “great date night” mean to you? AM: When I go on a date, I want to have fun. Conscious Cinema Club will most definitely be an evening of laughs, healthy treats, and an entertaining movie. GFC: That sounds like a lot of fun. Thank you so much for this interview. We had a lovely time speaking with you. We are so excited to see you at Conscious Cinema Club. AM: Thank you for having me. I look forward to seeing you at the studio on Earth Day! 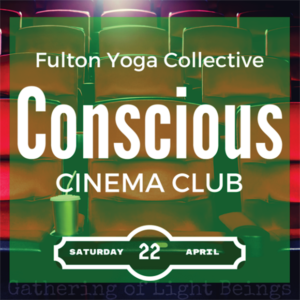 Reserve your free spot at the Conscious Cinema Club online at http://fultonyogacollective.com/fyc-classes/conscious-cinema-club . For more information, 2017 – “The Power To Change Our World” – Earth Day Article – FYC contact Fulton Yoga Collective via email at fultonyogaco@gmail.com or by phone at (559) 921-YOGA. Stay connected with Anna Moore at www.iamannamoore.com.